Design a character in MakeHuman, and equip her with clothes, hair, eyebrows, eyelashes, and a tongue. You may also want to add an alternative topology (a ”proxy mesh”). That is done in the Topologies tab. Also add a skeleton under the Pose/Animate tab. Feet on ground. If selected, the object center is located on the ground, between the characters feet. Otherwise the object center is located in the pelvis area, at the center of mass. Binary file. The MHX2 format uses the standard JSON syntax, but the files can optionally be gzipped to reduce space. 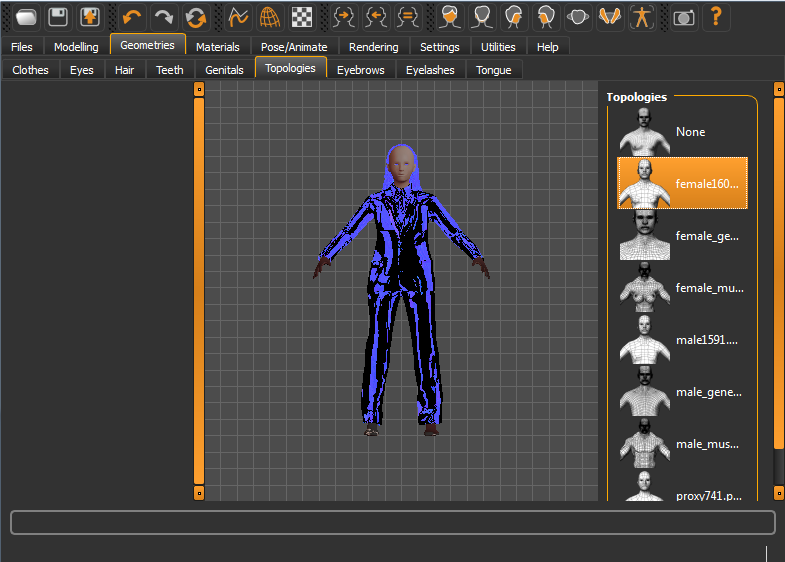 Finally give the character a name and press the Export button. Use the … button to save the MHX2 file to a non-standard location. Hi, under the pose/animate I can not find the makehuman-preset for export the file. I use the makehuman-version 1.02 with osx. Wich rig shall I choose? Choose any rig you want. Export for .mhx2 is under File tab and Export subtab. I cannot find the MHX2 rig with the facial rig. I reinstalled with the April version of the MHX2 importer. 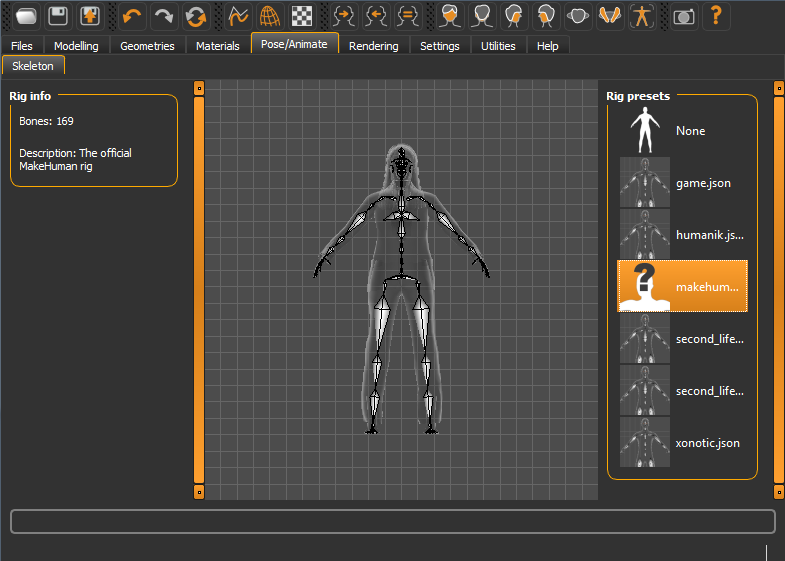 But when I go to the pose/animate tab, the makehuman2 rig does not show up. When I import and click the ”overide exported data” checkbox, I have the option for the MHX rig (with the facial slider panel) but not the mhx2 rig with the facial bones. How do I get the mhx2 rig with the facial bones. There is no such thing as a MHX2 rig. The only way to do facial animation with the MHX rig (which is essentially the same MHX rig as in MH 1.0.) is with shapekeys, either driven by the face sliders or not. The face bone belong to the MH Default (and Default without toes) rigs. 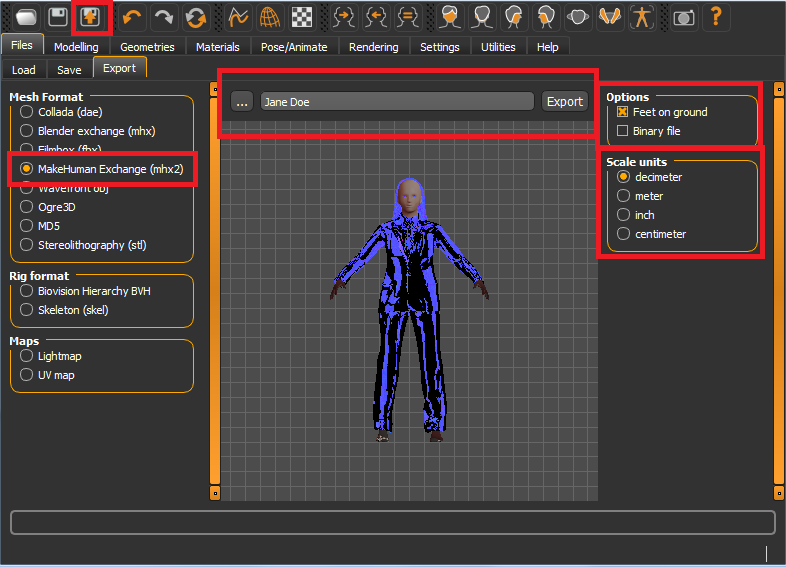 The MHX rig is constructed by the importer using the mesh data, the Default rig is made by MH when you select it in the Pose/Animate tab and then exported. I have a question. Which version of MakeHuman did you use? Do you have a link for this one? The goal is that MHX should work with the most recent stable version (MH 1.0.2) as well as a recent version of the development version, which should also be a nightly build. Did the roll bones calculation changed between MHX2 versions? Some Actions previously done are not correctly played in early MHX2 Exported rig. Are roll bones values recalculated when we override exported data from MH? Is there a way to get consistent roll values between armatures generated in different MHX2 versions? hey….. my makehuman doesn’t have the Mhx option, it’s the recent version. any idea what I can do? The Mhx exporter has been removed from MH. MHX2 should accomplish at least the same tasks, although it does it in a different way. 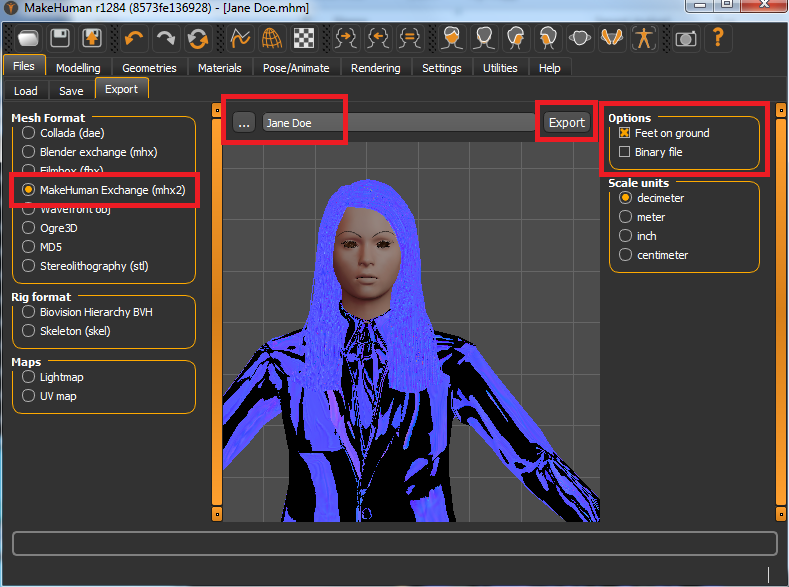 sir in mesh format there is not blender exchange(mhx) but also there is not make human exchange(mhx2) can you help me? Mhx and Mhx2 are completely different formats, although they roughly accomplish the same thing. The original Mhx is obsolete and cannot be exported from any recent version of MakeHuman. Hi, in the 1.1.1 version of MH there is neither .mhx nor .mhx2 export option. What can I do to export the rig into Blender? First of all thanks for your great contribution to the open source community, this software is really marvelous, as I recently came across this software. The mac version of MAKEHUMAN is now not supporting mhx or mhx2 format export, hence we are unable to import the models in blender with the new features. Can you please see if something got missed while rolling out the version for mac (.dmg installer file). Sorry, but I don’t know what may have gone wrong. I hav not worked on MH for several years, but I started up the most recent development version version and did not encounter any problems with export.